If you're introducing a new kitten, don’t be surprised if your older cats react with great hostility at first; they will sometimes hiss and spit at the kitten for up to two weeks. Don’t scold your 'old' cat for this kind of behaviour; it needs a lot of extra love and reassurance that it is not being replaced in your home and in your affections. Practically ignore the kitten in the older cat’s presence, but touch both cats often in order to transfer their smells to each other. Giving the older cat all your attention will also help the kitten to understand that the older cat should be deferred to. Initially, keep the kitten isolated and confined to a secure room (with a radio and a warm or luke-warm hot-water bottle for comfort) when you go out, and only allow it to come into contact with existing pets once you are very sure they have all accepted each other. Don't suddenly change your habits, for example by kicking your older cat out of your bedroom so that the kitten can sleep with you; it is important to disrupt the older cat as little a possible. Also ensure that your kitten is kept indoors for several months before letting it begin to explore the outside world. That the child may hold the kitten only when the child is sitting still, not when s/he is walking or running. That the child learns to release the kitten as soon as it begins to wriggle. If you’ve just adopted an adult cat or moved it to a new house, keep it strictly indoors for at least two weeks - this is essential for its safety. Begin by confining it to one room of your house for several days (preferably a spare room or other tranquil room, such as a study). 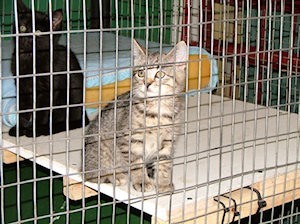 Provide fresh food and water and a clean litter box, and if possible a radio. After several days, slowly introduce your new pet to the rest of your house, without letting it come into contact with other pets, until it has become used to all the smells, sights and sounds of its new home. When introducing a new cat to existing cats, the biggest mistake you can make, is rushing things too much. Begin by exposing the "old" cat to the smell of the "new" cat by rubbing a piece of cloth over the new cat, presenting it to the old cat to smell, rubbing another piece of cloth over the old cat, and presenting it to the new cat to smell. Then apply both smells to the same cloth and present it to both the old and the new cats until neither of them react to it. The next step is to add the smell of the owner to the piece of cloth (push it down your T or bra and keep it there for a while). Then mix a teaspoon of used litter with the other cat's litter. Later, apply "timesharing" overnight, in other words keep one cat in the room and let the other one out in the rest of the house, and swap them around the following night. Allow them to see each other through the barrier of glass or mesh for gradually longer periods until they calm down completely. At last, remove the barrier and try to remain calm yourself! If you have dogs, introduce them one by one to the newcomer (keeping boisterous dogs on a leash at first) after the initial settling-in period described above. Make sure that you are present when the animals first meet as well as for the first several weeks, until you are completely sure that they have accepted each other. 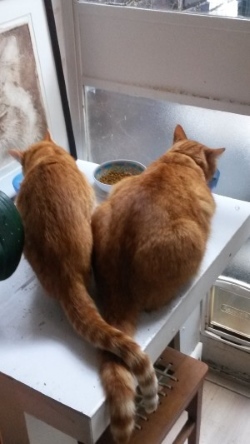 If you’ve been planning a holiday, it’s an excellent plan to put the old and new cats in a cattery together, since they tend to accept each other much more easily on neutral ground. Remember to explain the situation to the cattery owner, though, so that he or she can keep a watchful eye on your pets. Then, when you take all your cats home, keep the new one indoors as described above, and allow the 'old' ones to visit it several hours a day. After two weeks, start introducing your new pet to the garden, an hour or so at a time, preferably under supervision. It's also a good idea to teach your cat which window to use to get into and out of the house by physically guiding it in and out of the window several times. When your pet is completely settled in, ensure that this window is always kept ajar. Alternatively, have a pet door installed in one of your outside doors. What food do I give? If possible, feed your kitten or cat one of the balanced, nutritional and tasty dry cat foods supplied by your vet. This will meet all your pet’s nutritional needs, and will ensure that it enjoys a long and healthy life. Although these foods may strike you as expensive, smaller amounts are needed compared with the supermarket brands, and since these foods will keep your pet healthier, you save on vets' bills in the long run. Brand names we recommend are Iams, Royal Canin and Hill's Science Diet. Also ensure that your kitten or cat always has fresh water. If you would like to give your pet treats, keep them small and infrequent. Remember that fish or dairy milk can give cats, especially kittens, diarrhoea. What bedding should I provide? Most cats enjoy sleeping just about anywhere and will choose their own favourite spots. Placing soft bedding materials in baskets or 'cat caves' (available at pet shops or from your vet) in secluded, cosy corners will encourage your pet to use them. What toilet facilities are needed? Ensure that your cat always has a clean litter box - preferably more than one for small kittens, since they might not be able to hold out if a litter box is not nearby. Even when your pet has started going out, it’s a good idea to keep at least one litter box indoors for rainy days. Fill the litter box to a depth of about 7 cm, and keep it clean by removing the solids twice a day and either removing moistened litter or mixing it in with dry litter. What toys should I allow? Cats love toys. You can buy soft balls or 'mice' filled with catnip from pet shops or your vet, or you can make toys like balls of paper or foil. Make sure the toys are too large to swallow. Balls of wool or string aren’t a good idea, as they can become lodged in the cat’s intestinal tract or tangled around its neck. How do I keep my cat safe in and around the home? It’s a good idea to check enclosures like garages and tool sheds before locking up for the night or when you leave the house, just to make sure you don't inadvertently shut your pet away for hours (or days) with no food or water. Also remember that very small children don't always know what might hurt an animal. A child's passionate (but unwittingly rough) stroking or patting could harm your cat - possibly even fatally. So keep an eye on kiddies who want to 'play with the kitty', for their sake as well as your cat's. Should I groom my cat? Although your cat will groom itself every day, you could help it by brushing it regularly to prevent its hair from matting, thereby avoiding the ingestion of hair balls. Do I clip my pet's nails? It your pet's nails become too long and hook onto everything, cut only the tips of the rounded nails using special clippers or sturdy human nail clippers. Do this chore where you can see well enough to ensure that you don't cut into the quick of the nails. Keeping the nails fairly short will minimise damage when your cat 'sharpens its nails' (when it is actually depositing its scent) on your furniture. You could also get your cat a scratching post. The least expensive are available from most supermarkets. Should I train my kitten? Never raise a hand to your pet, since you will lose its trust. If you want to discourage it from doing something, it's a good idea to keep an unused manual pump spray bottle filled with clean water handy. It usually takes only a few gentle squirts in your pet's direction to get your message across. Also, your pet won’t associate the discipline with you, but is more likely to develop quite a dislike for the spray bottle! You could also on occasion give a shout and clap your hands loudly to discourage something you can see is about to happen. How do I care for my cat's health? A kitten should receive its first inoculation and deworming at 6 to 8 weeks, and boosters a month later. It is very important to have it sterilised at 5 to 6 months. It is not true that a female has to have at least one litter before being sterilised. This holds no benefits whatsoever for her, and only adds to the already huge number of unwanted kittens in the world. Toms also benefit from being neutered as they tend to wander less and get into fewer fights. Neutered toms are also far less likely to contract feline Aids. In South Africa, sterilisation costs around R700-R900 for females and a little less for males. If this is too steep for you, please contact NCat, and we will try to arrange for one of our participating vets to sterilise your pet at a reduced fee. Take your pet for a veterinary check-up every 6 months, and consult your vet about anything out of the ordinary. Look out for signs of illness such as repeated sneezing, runny eyes, congested nose or loss of appetite. If you notice any of these, take your cat to the vet as soon as possible; quick action can prevent serious illness. Keep ticks and fleas at bay with the aid of one of the excellent products available from your vet, such as Frontline, Advantage and Program, and deworm at least twice a year. How do I transport my cat? Transport your cat in a sturdy pet carrier such as those available from vets or pet shops. This reduces the chances of losing your cat if it panics for some reason. It's best to keep your pet in its carrier even while travelling in your car to ensure its safety just in case you have an accident. There should be enough ventilation in the car but no draught, and if you have to let your cat out of the carrier, be careful not to open any window wider than about one centimetre (half an inch), since a nervous cat can escape through extremely narrow openings. It's also a good idea to keep some paper towelling in your car in case the stress of the journey gives your cat an upset tummy. Never allow your pet to leave the car anywhere except at home. What identification do I use? Collars and name tags are important aids in ensuring that your pet finds its way home if it should get lost. We recommend that you use a collar consisting entirely of elastic material, so that the cat can pull its head out if the collar should get stuck. Fit the collar snugly (you should be able to slide in only two fingers), take it off to cut off the excess, and burn or glue the tip to prevent fraying. When the glue has dried, slide the collar over your pet’s head. The bells attached to these collars help to curtail your cat’s hunting activities, which can only benefit the 'wildlife' in our cities! It is also vital to have your cat or kitten microchipped. This simply involves asking your vet to implant a microscopic identification chip under its skin. It takes seconds to do and doesn’t hurt any more than an injection, but it could very well ensure your cat’s safe return if it should stray or be stolen. Ask around the neighbourhood in case your pet has been locked into someone's garage or tool shed. If not, and if your pet is still missing after a day or two, place leaflets in post boxes around the neighbourhood. Provide a picture of your cat on the leaflet if you can, as well as a description, and of course your address and/or telephone numbers. Also offer a reward. You don’t need to mention a specific amount - if your cat is returned to you safely, a specific amount can be decided on then, depending on the circumstances. Add a reference to the family being "heartbroken", as this may help if someone is keeping the cat because they don't want to give it up. Place ads in the local papers. Most papers have a classified section with a 'Lost' column, and some papers even place such ads free of charge. You might have to call the paper every four days or so to renew the ad. Keep it up for at least a month if necessary. Keep up to date with the information in the 'Found' columns of your local papers, since some kind person might advertise if they have found your cat. Contact schools in your area. Some schools are prepared to make announcements at assembly times about missing animals. Register your cat's details with Petfinders, Pet Finda and Pets Lost and Found at admin@petfinders.co.za, petfinda@gmail.com and petslostandfound.co.za respectively. Also see http://www.missingpetpartnership.org/recovery-lostdog.php (for dogs) and http://www.missingpetpartnership.org/recovery-lostcat.php (for cats). How do I care for my indoor cat? If you have to keep your cat indoors all the time, make sure that it can move freely within your house or flat and that it always has access to fresh water and a clean litter box. You could also provide a flat dish planted with grass, since most cats like to nibble on a sprig or two every now and then. If your cat lives on the upper storey of a block of flats, protect it by keeping your windows only partly open, or cover the windows with mesh. How do I keep my cat from worrying the neighbours? There are a number of things you could do. Supply your neighbours with a clean spray bottle filled with water and ask them to spray your cat whenever it enters their home. Alternatively you could suggest that they make a loud noise when they see your cat, eg by clapping their hands or by shaking a tin filled with stones. You could also supply them with a feral cat trap and give them permission to trap your cat on their property and then spray it with water, to deter it from visiting that property. If all else fails, have an electric fence or a special cat-deterrent fence installed to keep your cat on your own property. Although the dictionary defines 'feral' as 'wild, untamed', the label 'feral' is often used to describe any homeless cat – tame, semi-tame or wild – living in the streets of our cities. There are many reasons that have brought them there. Some are strays that have become separated from their owners, who may have moved and not socialised them properly at their new homes. They may have been abandoned, or they may have escaped due to abuse or neglect. Many are born in the streets from either formerly tame or wild mothers, and since these kittens don't come into close contact with humans during the crucial first two months of their lives, they remain 'wild' – in other words, afraid of humans. Give them a safe place to live. Allow them to use that shed at the bottom of your garden, for example. Feed them away from the house, so that they aren't tempted to come and eat your pets' food. If they do come into your home, we have some suggestions for you under 'What can I do when a feral comes into my home' below. Pregnant feline mothers or mothers with small kittens are often desperate for somewhere safe to raise their young. If you have a secure room that you can spare for 6 to 8 weeks, you could perhaps allow her to use it. Contact a volunteer organisation in your area (contact NCat for details) when the kittens are around 4 weeks old for help to have the kittens socialised and eventually adopted and the mother sterilised. Supply food. A dependable source of food and water makes a huge difference to feral cats' lives. 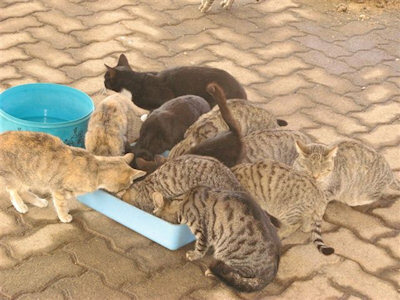 If you would rather not feed feral cats yourself, you could help the volunteer organisations in your area do the job by donating food and/or money. Have them sterilised. A single fertile female produces about 16 kittens a year. If half of them are female, they and their descendants can, within a few years, multiply to thousands of strays. But sterilisation is vital not only to keep feral cat numbers under control - it also makes a big difference to their lives, whether they be female or male. Contact NCat for help in your area. Remember that, before a cat is sterilised, an expert should check that it isn't perhaps a lactating female. If so, she has kittens hidden away somewhere and she should be returned to them without delay. Also remember that when feral cats are sterilised, they should be kept at the vet's until the following day. What do I do when I discover a feral mother cat with kittens in my garden? Remove the kittens from the mommy cat and get them to a foster that will be able to bottle-feed them, or do it yourself by using Kitty Milk or one of the other products obtainable from vets. This should not be done lightly, since the mommy will wander around for days calling for her babies, and may develop mastitis. Only go for this option if the kittens are in danger. How do I foster a feral family? Provide the family with a box placed on its side in which an opening has been cut. The opening must not be so small that the mommy may feel claustrophobic, and it must end about 3 cm off the floor to prevent the kittens from crawling out while they are very small. Provide the mommy with good quality kitten food (which she needs to eat while lactating) and fresh water. When the babies are being weaned, the mommy will teach them to eat the same food. Also provide a litter box, which at first should contain a layer of real soil from the garden. Give the family a day or so to settle, and then begin to approach the kittens carefully and slowly. The mommy may hiss at you but will then probably hide in the box. Sit next to the kittens and begin to handle them carefully and gently, speaking softly and reassuringly to the mommy. Do this for a few minutes only the first time, to show the mommy you mean them no harm. Repeat this later the same day. From day two, begin to lengthen your playing sessions, until the kittens are completely used to being handled and are climbing onto you of their own accord. Do not change the bedding for the entire time that the kittens are suckled. They do best with their own, familiar smell, and the mommy will do all the cleaning that is necessary. Once the kittens begin to eat solids themselves, provide them with a flat litter box. If they make droppings anywhere else, move the droppings to the litter box, and they will soon get the message! How do I tame a feral kitten? If the kittens are over 6 weeks old, you may never be able to tame them completely, or some may become socialised and others not. The younger they are, the better your chances are. Keep the kittens in a smallish space, such as a small bathroom or ideally a small cage that stands with two of its sides covered or pushed up against walls, to give them a feeling of safety. Provide them with a cat cave, food and water, a litter box removed as far as possible from their food, and toys to play with. For the first day or two, don't try to touch them, but spend as much time with them as possible, even if you only sit and read in or next to their cage. Speak to them often, looking at them while slowly batting your eyes to indicate that you are no threat to them. If they are in a larger room and are hiding under a bed, ensure that their food, water and litter box are close enough to the bed that they needn't venture into the room to reach them (else they may go without food and water). Several times a day, go and lie flat on the floor next to the bed to talk to them gently while batting your eyes slowly. On around the 3rd day, begin playing with them gently using a long feather such as a peacock feather. Try to stroke the feather gently over their little bodies. They will not be as spooked by the feather as they would have been by your hand. Continue in this manner for a few days until you see that they are beginning to relax. Play it by ear from then on, perhaps trying to stroke them with your hand while they are eating, etc. Slowly but surely, they will come around. Once they are tame enough for you to catch them by hand, begin to bring them into your family room for an hour or so a night, to give them the opportunity to be in a room containing a TV, telephone, chatting people etc. If you have other animals, keep them outside at first. Small, noisy children will also spook them, so try to keep children from rushing at them and trying to pick them up. Generally, you would need to get them to the point at which they are completely at ease with human company in order to home them. How do I home kittens? 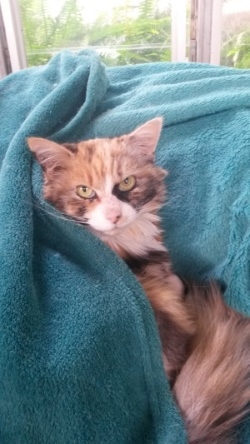 You could also ask questions about where the kitten will sleep, what food it will be given and other general questions, to get a 'feel' for the kind of prospective owner you are speaking to. If possible, have the kitten adopted by means of an 'adoption package', which most rescue organisations will be able to arrange. That way, you can be assured that the kitten will be receiving its important shots, deworming and microchip, and that it will be neutered at the correct age. It is very important not to allow new owners to fetch a kitten from you, but rather to deliver the kitten to its new home yourself, in order to check whether everything is above board and to help settle the kitten into its new home safely. Ensure for example that the kitten cannot get out of the house or flat for the first few months. (See 'How do I handle the introduction of a new kitten or cat?' at the beginning of the FAQ section above.) If possible, make a printout of the FAQ section for tame cats above, and give it to the new owner to read. What do I do if a stray comes into my home? If the cat is tame and in good condition, it's probably someone's pet. Hopefully, being trapped on your property will keep it from returning. If not, you could try to catch or trap it again and take it to your local vet, volunteer organisation or humane society. Make sure it's scanned for a microchip and if it isn’t microchipped, advertise for its owner in your area and in your local newspapers. If the cat is tame but in bad condition, it's probably a stray. You could either release it and carry on feeding it outside while you try and find its owner, or you could take it to your local vet or welfare organisation to check for a microchip and for safe-keeping. You could then help them to advertise. If the owner can't be found, you could help find the cat a new home by advertising and/or giving a donation. If the cat is wild but in good condition, it's probably a feral that is coping well and will find another food source if it can't return to yours. Once again, the experience of being trapped might very well discourage it from returning to your home. You could either release it immediately or have it sterilised before releasing it back into its familiar area. Feeding. Feed them regularly so that they stay healthy enough to keep rodents, snakes and strange cats at bay. If the cats are not fed, they will not go elsewhere, but will start going into the buildings to look for food. Their condition will also deteriorate, and they will eventually become unable to control rodents and strange cats. A well-fed cat is the best hunter. Feeding the cats at fixed times and fixed places also makes the process of sterilisation easier. NCat recommends that you feed feral cats a balanced dry food and provide fresh water regularly. If you live in the Johannesburg/Pretoria area, we will enable you to buy a medium quality catfood at a reduced rate. Contact anneke@ncat.co.za. Sterilisation. 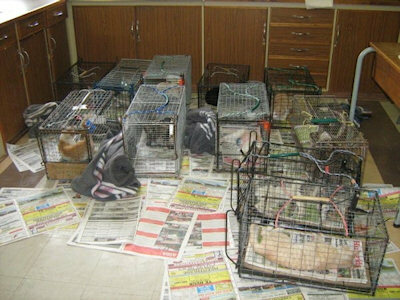 As already mentioned, sterilise as many of the cats as possible to prevent further expansion of the colony. Most feral cats will need to be trapped in special traps, and you will have to find a vet willing to undertake the sterilisation, preferably at a reduced rate. If there is no welfare society or helpful vet in your area, contact NCat for help (anneke@ncat.co.za). Medical care. If any of 'your' cats are taken ill, you will need to try and get it to a vet, or get medication for it. 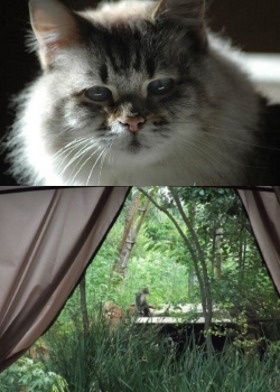 Sometimes it is possible to trap a sick feral in a trap with the aid of strong-smelling food, but often when they are ill they are not interested in food, and then it can become very difficult to catch them. In the case of 'snuffles', it is usually easier to obtain medication from the vet to mix with wet food. To treat an entire colony, you could mix one cap of Betamax on a tin of wet food twice a day, and try to spread the food evenly among the members of the colony. Can I move a feral cat to a new place? It is very, very hard to find suitable alternative places for feral cats, so we usually recommend that the cats are kept in their own surroundings and solutions are found for whatever problems there are. Very occasionally, however, such opportunities do come along, and then it is very important that the cat be confined in the new place for about a fortnight with its own food, water and litter box (containing, at first, a mixture of litter and real soil), so that it gets used to all the new sights, smells and sounds of its new home. After that, it can be released, but care should be taken that it be allowed to investigate the new area without being spooked by other animals or people. If an adult feral cat is not confined in this way, but is simply taken to a new area and released there, it will almost certainly try to make its way back 'home', facing many dangers along the way. According to Dr Quixi Sonntag, a well-known veterinary behaviour practitioner, if a feral cat released in this way does actually stay in the new area, it will have to cope with the trauma of trying to find and get access to new sources of food and water. 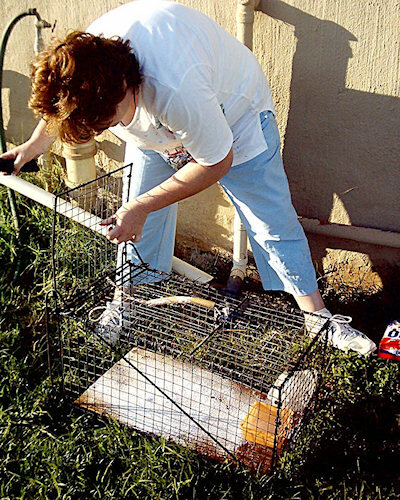 Releasing ferals in this way in a new area is therefore not recommended.